This essay will begin by defining the word “organization” as it relates to the Watchtower Bible and Tract Society (WBTS), and the Christian Church. The questions raised include: Do the scriptures reveal any organized systems of worship? If yes, then what was the purpose of such organization and did it constitute a theocracy? If a theocracy once existed do Christians still live under a theocracy? What exactly does the New Testament reveal concerning Christian worship and practice and does a theocratic blueprint still exist? If not, why not? Whether expressed in terms of ecclesiastical systems, Church government, elders, bishops or a small gathering in a home, “organization” is a complex and often divisive topic; therefore this essay can only scrape the surface of such a vast subject. That being said, an honest study of organizational concepts within the biblical revelation will act as a healing balm to those spiritually damaged by the WBTS. Indeed, I pray that a candid examination of the facts will provide scriptural reassurance to all Christians who are suspicious of organizational structures within Christendom. Let us begin with “organization” as it relates to the WBTS. Much has already been written on whether or not Jehovah has an earthly organization, therefore this essay will not go over that ground. Instead let us consider how the word “organization” for many Jehovah’s witnesses gives calm assurance of Jehovah’s protection while for former Jehovah’s Witnesses “organization” is a ‘dirty’ word, an oppressive term, reminding them of a time in their lives when they gave abject allegiance to the WBTS. I remember my own mindless acceptance of whatever the society proposed whether through a watchtower article, new literature or scripted talk. As a Jehovah’s Witness you simply did as you were told. You obeyed the “organization” – but why? The answer is a simple one. In sincerity and honesty the active Witness believes that the Jehovah God expresses himself, providing ‘food at the proper time’ through the structure known as the WBTS – otherwise affectionately called the “organization” or “society”. According to Witness theology God chose the “society” in 1919 to be his channel of communication to humankind. By accepting this claim, a Witness comes under the control of the society. To a Witness, the WBTS is unquestionably accepted as God’s mouthpiece through which “truth” is disseminated. The corollary between God and the organization forms a cohesive bond in the mind of the active Witness. Hence Jehovah’s Witnesses become “captives of a concept” in that they cannot separate Jehovah from the WBTS; in the mind of a Witness the two are one of the same. This illusion is further compounded by the acceptance of a self-appointed group of men known as the “the Governing body” or “faithful slave”. These men have total ecclesiastical authority over the organization and operate with god-like superiority over all practicing Witnesses. The Governing body is therefore synonymous with the concept of God’s organization. Herein we have our first definition of organization as it relates to the WBTS. Please note that the WBTS from its “inception” was sectarian, in that Russell was opposed to institutional Churches, which he claimed had apostatized from scripture. Despite this, many restorationist/millennialist groups which were founded in the 1800’s coalesced around a strong personality and regular newsletter/magazine. Thus although these groups were generally anti-organizational they were actually organized around a man and his publication! As we shall see later, a rejection of Church “organizations” is not necessarily corollary to scripture. Let us try and understand why some people become Jehovah’s Witnesses and subsequently submit to totalitarian rule. Firstly, our modern/post-modern world can be a very difficult place in which to live. Our Western world view promulgates an individualist way of life wherein nothing is fixed, everything is uncertain and absolutes have been replaced by relative truth; this world view cries ‘autonomy is the only rule’. However the holy maxim “empower yourself” is not necessarily what every human craves. For many people the modern/postmodern metanarrative offers no hope. This can lead to nihilism wherein people find themselves disconnected from society, lacking self-worth, and generally unhappy. Not satisfied with the status quo, spiritually hungry people are ripe for Watchtower conversion. There is no hell, because death is annihilation. Jesus cannot be God, because Jesus died, and God cannot be annihilated. The Holy Spirit must not be a divine person. Moreover, if Jesus was annihilated, there is no reason to expect that his body would be raised from the dead. Thus we may conclude that Jesus was raised as a spirit. But this implies that Jesus will not return physically to the earth. Therefore, his second advent will be a spiritual presence rather than a physical return. This allows his second presence to be understood to be happening at this time, unseen except to those who have spiritual insight. Moreover, if Jesus is a spirit and is to remain forever in heaven, and yet the Bible teaches both that there will be a bodily resurrection and that some will live with Christ and share his nature, that implies that there will be two classes of the redeemed – an early class and a heavenly class. In such a construct Jesus is viewed only in relative terms of functionality and while imperative is still only part of Jehovah’s grand plan. By blurring Jesus’ mediatory role and in turn exalting the earthly organization to all intents and purposes, the organization is itself deified. This is underscored by the regular use of the word “organization” in Watchtower literature. For example “organization” as it relates to the WBTS was used 16,789.00 times in the 2006 CD edition of the Watchtower Library. This repetition reinforces the concept that Jehovah and his earthly organization are one of the same. I submit to you that Watchtower adherents unknowingly worship the society as the embodiment of Jehovah himself. Indeed members are so reliant on the “organization” that a Witness could not function without it. Testimonies of former Jehovah’s Witnesses confirm the difficulty of deprogramming and fitting back into society. Sadly Jehovah’s Witnesses that leave the organization often fail to adequately address the question of “Jehovah’s organization” and the credibility of its doctrines. Consequently many who leave the “Organization” subconsciously remain Witnesses and thus continue to play second fiddle to the society and its doctrines. A person may have been inactive for decades and yet still be held captive to Watchtower concepts resulting in hidden guilt and despair. In my own journey out of the Watchtower I remember reaching a critical juncture, an impasse that appeared insurmountable which related directly to the concept of organization. I had been a ministerial servant for several years and had been given many “elder” responsibilities, including: conducting the “Book Study”, giving Public talks, taking field service, arranging hospitality and shepherding Rota’s etc. Add to these duties the responsibility of running a business and caring for my wife and three young children and logic demands something had to give. I’m sure many of you can relate to this kind of treadmill existence. As I contemplated how my life operated, or rather who operated my life, it became uncomfortably clear I was controlled not by Jehovah, but by an organization. I wondered to myself “could this organization simply be man made”? I remember the location of my wake up call; it was during a visit to the town of Boston, Lincolnshire, England whereupon I ended up in a debate with an evangelical preacher. He forthrightly told me that I was ‘spoon fed from Brooklyn’ and that I could not ‘think for myself’. While rejecting off hand the notion that I was ‘spoon fed’ the accusation had profound ramifications. His words dropped into my spirit and began to ferment. As I wrestled with my emotions the scripture that kept bugging me was Matthew 11:28-30. I asked myself where was this promised rest? Why could I not find peace and happiness? After all that was the promise when I signed up! I had of course found a religion of unity and conformity but true internal peace? That was another matter. The sad truth is there is no spiritual rest for a Jehovah’s Witness. Instead salvation continues to be a works orientated ‘hope’, that somehow you will do just enough to “make it” through Armageddon. There was no grace and no assurance, only fear and intrepidation; a far cry from the true peace that Jesus promised to those who put faith in him (John 14:27). On reflection I struggled to ‘fit in’ with the ‘real world’ and it was this disconnection with life that drove me to escape into the world of the Watchtower. I sought to please Jehovah by my works. I had unwittingly become trapped in a works orientated cult. It took me a long time to admit this fact, but in the cold light of day I had to admit that the “organization” was indeed man made. This brings us back to our question of organization. We have established that the word ‘organization’ in the mind of a Jehovah’s Witness encompasses the embodiment of Jehovah himself, the two concepts are inseparable and axiomatic. Jehovah = the organization and vice versa; leave one and you leave the other, serve one and you serve both. Because of this deeply entrenched concept it is imperative for ex-Witnesses to deprogram from this organizational illusion. However, while we would encourage an ex-Witness to deprogram, one negative backlash is the rejection of all-organizational structures; including legitimate civil, judicial or religious structures. Such anti-establishment reflects the individual desire to never again come under the control of man-made organizations. This mentality is compounded by post-modern philosophy. The rejection of organization can produce highly unstable individuals, resulting in: feelings of worthlessness, suicide, depression, aggression, escapism (drugs/alcohol), immorality, moral abandonment, materialism, etc. Conversely, for the ex-Witness who takes the time to objectively re-examine the Bible, a fresh positive understanding of “organization” may emerge with God’s grace and mercy. However, the spiritual damage done can be so profound that even a born-again Christian will seek an individualistic walk with the Lord. In such cases, Christian organizational structures may be avoided. The result is a “lone ranger” embarking on a “desert island” kind of Christian walk, which is understandable yet neither healthy nor scriptural. One warning I will add at this juncture is that if you are an ex-Witness and beginning to examine the scriptures and re-evaluate your religious convictions be extremely careful when revisiting the Bible to make sure you jettison ALL your Watchtower presuppositions. This would include doctrines such as: the soul equals the whole person, annihilationism, hell, millennium, resurrection, spiritual Israel etc. Unless this is done you will read back into scripture your Watchtower doctrines and in turn seek religious groups that hold similar views. Instead, you must approach the scriptures with the illumination of the Holy Spirit alongside a fresh piece of paper, a clear rational mind, and with open eyes and heart. Without this purging of WT doctrines the likelihood is you will simply return to a former era of Witness activity. Sadly, many former members have found solace in the Watchtower’s pre-Rutherford era claiming some sort of apostasy took place after Russell. While it is important to follow the ‘paper trail’ and re-evaluate the origins of the Watchtower it is imperative not to fall into the trap of early Russellite teaching. The danger is that heretical groups such as the Christadelphians, Universalists, and SDA become attractive alternatives to the WBTS. Be very careful not to simply exchange one error for another. Rather take the time to let the scriptures speak for themselves. Pray earnestly for the Holy Spirit to guide you and seek to uncover who Jesus really is, as the key is Jesus and not revised doctrine. In this way, I truly believe the Holy Spirit will lead you to an orthodox understanding of scripture revealing the true nature of Christ, his person and work as God incarnate. So far we have examined how the word organization relates to the WBTS. While we have not deconstructed the illusionary concept, we have explored the human cost, mentally, emotionally and theologically. When an organization takes the place of God the power over active and inactive members is disturbingly destructive. However, what of the concept of organization in scripture itself? Can we locate systems of worship, which we can honestly call organization? Moreover does the New Testament provide any blueprints for organization within the Christian Church? My presupposition from here on in is that I am engaging with former Jehovah’s Witnesses who have now been born-again as children of God and accept the tenants of orthodoxy (right teaching). The comments below are in no way exhaustive or absolute, but they outline key points from biblical history which relate to the word organization. From these points we can draw working principles to help us in our Christian walk. To begin with, scripture relates how Yahweh dealt directly with individuals. From Adam onward through History, Yahweh has sought interrelationships with humans. This is a very important fact to recognize. Such close intimacy with God – that of “knowing” him as a close friend is a mythological concept in the mind of Jehovah’s Witnesses. Why is it that a Jehovah’s Witness cannot form a relationship with the Father? The answer is simple yet profound, without revelation of who Jesus is, namely the divine Son, the “I AM” of Exodus 3:14-15 and John 8:58, true intimacy as a child of God is unattainable. To “know” God is to first “know” Jesus. However the tender language of intimacy is almost mythological in Jehovah’s Witnesses conversations; instead it is “Jehovah’s organization” that is continually worshipped. Contrary to this blasphemy the scriptures unambiguously promise intimate fellowship, but with who? Notice the promise of scripture, fellowship is promised with the Father, the Son and the Holy Spirit. The Greek word used here for fellowship is κοινωνία, meaning “an association involving close mutual relations and involvement—‘close association, fellowship”  Jehovah’s Witnesses are robbed of these intimate fellowships with the divine Yahweh. Instead the Jehovah of the Watchtower is a cold, distant, demanding, and capricious God; this distortion of the divine character is a millions miles away from the triune Lord of scripture. This estrangement from the Holy God of scripture grows not only out of heretical doctrines, but also Biblical revisionism. Revisionism is when an interpreter re-writes past history according to a particular bias. This is exactly what the WBTS had done; worst still it has written itself into scripture by claiming prophetic fulfillment as the “Faithfull and discreet slave”. Consequently in Watchtower thinking, all roads lead to itself – the organization! So how does God view organization? Has God ever created an organization through which to address humankind? Firstly we must be clear that in scripture the word organization does not exist. However the concept that God expresses himself through an elect group does. Whether the term “organization” is applicable to such an elect group is debatable. Who then did God first choose? Therefore the Christian doctrine of the incarnation can be viewed as a development of the Bible’s account of God’s movement toward human creation in the people of Israel. This is a profound point to ponder for anyone denying Christ’s deity. In all of this, the movement of Yahweh towards man is intimate and not just perfunctory. A perusal of the Psalms confirms the intimacy that pre-Christian saints had with God. Within the Law we find the two greatest commandments to love God and neighbor (Deuteronomy 6:5, Leviticus 19:18), upon which – according to Christ – the whole law and prophets hang (Matthew 22:37-40). It is this one-on-one divine love that counteracts legalism and self-righteousness and instead plunges the believer into intimate fellowship with God. Unlike the endless Watchtower demands for evidence of good works, a Christian life that is intimate with God naturally produces good works without pressure or coercion. What a wonderful truth that is! From the Abrahamic covenant and election of Israel developed Yahweh’s theocratic Kingdom. The laws to govern this theocracy were given to Moses at Sinai (Exodus 24:12; Deuteronomy 4:44; 31:24). However, when Israel’s leadership eventually rejected the Messiah, God’s Theocratic rule on earth temporarily ceased. Nevertheless a new spiritual entity emerged, namely the Church or “called out ones”. Beginning as a purely messianic sect and a remnant from the rootstock of Israel (Romans Chapter 11), the Church (ekklesia) eventually incorporated both Jew and Gentile into “one new man” (Ephesians 2:15, Romans 11:25, John 10:16). Moving from the era of Mosaic Law into the Christian era, the ekklesia of God were saved not through adherence to Mosaic law but through grace (Romans 11:6). Heartbreakingly Jehovah’s Witnesses have no concept of the Gospel of Grace. Instead the WBTS presents the narrative of “Jehovah’s organization” claiming that God has always had an “organization” which believers must obey. The spiritual result of accepting this lie is servitude to a man-made “organization” (Matthew 15:9; John 5:39-40). Contrary to WBTS claims, as we arrive at the Christian era, we can confirm that Yahweh did not continue to have an earthly theocratic “organization”. How then are we to understand Christianity? Does not Christianity express itself in terms of “organization”? Well it is certainly true that throughout Church history “organization” has been employed. However organization should be understood in the sense of administration. You might say the Church is not an organization, but there must be organization in the Church. This is far different from an authoritative organization which operates a totalitarian regime over its members. Loose organizational arrangements can be found throughout the NT, we find appointments of elders (Titus 1:5), gifts of administration (Romans 12:7,) and collections for the needy (1 Corinthians 16:1-2) etc. However, whatever the organizational arrangement the goal was the same; edification of the body/Church of whom Christ is head (1 Corinthians 12:12-27). It is imperative that all Christians maintain a clear vision of Christ as head of his Church (Ephesians 5:23; Colossians 1:18), no matter what denomination you fellowship with. Nothing must supersede or divert the Christians direct communion with the Head. The indwelling spirit supplies the humblest Christian with guidance, which is unfailing when rightly used. This headship principle between Christ, the Church and the individual member is usurped by the WBTS and the so-called “Faithful slave/Governing body” assumes the role of mediator. So while an individual Witness is encouraged to pray to Jehovah, no spiritual autonomy really exists. Religious practice and faith is processed through the Watchtower “organization”. While it is true some Christian denominations have sadly become sectarian and even cultic in nature, this does not reflect the NT revelation. Christians are not bound to any one expression of Christianity. Yes multiple denominations exist and some are better than others, but denominations are not the Church. The Church is the people and their head is Christ! That means across all Nations millions of Christians find unity with God in Christ. This spiritual identity in Christ transcends all social and ethnic barriers, no longer is any single “organization” looked to for guidance but rather each born-again believer is washed clean, sanctified, and regenerated through the divine gift of grace. No longer is a Levitical priesthood required for all believers belong to a spiritual priesthood and not just 144,000, nor are temple sacrifices needed because Jesus our Passover lamb has been sacrificed. What we discover is that much of the OT mosaic laws (if not all) become shadows or types of the superior and completed work of Christ (Colossians 2:17; 1 Peter 2:9; 1 Corinthians 5:7; Hebrews 8:5; 10:1). Today a growing number of Christian’s -possibly without knowing it – have adopted a postmodern view of fellowship. Postmodernism seeks to deconstruct traditional models and set people “free” from oppressive “organization” – this includes traditional forms of Church. Christians who seek to replace ecclesiastical structures believe the spiritual unity of all believers should suffice. However, while the NT Witness provides clear evidence that the NT Church operated informally with very little (if any) liturgy, the individual members still had visible expression. In other words, communities of believers existed. Some would argue we must return to a purer form of fellowship, pointing to the NT gatherings of Christians in private homes (Philemon 1:2). However the NT Church does not necessarily set a president to abolish modern-day Church organizations. Yet we must confess that organizations can quickly become man-centered and “home Church” while admirable, can fall miserably short of the NT ideal. I guess you can say born-again spirit filled Christians constitute a perfect spiritual Church but humanly speaking reflect a very imperfect expression of that reality! We must remember that ultimately the Church comprises “people” who are bound to one another by re-birth. As such, no matter where we meet, the exhortation is the same; God’s children must regularly gather for edification (Hebrews 10:25). In this way each believer lives out his Christian life as part of a local body of believers, just as the NT confirms. Such fellowship brings with it mutual accountability. As we get to know people in our fellowship we begin to practice “the law of Christ” sacrificially living in community. This is a wonderful provision from our Lord and provides a visible witness to the unbelieving world. Nevertheless, I admit finding a good biblically sound fellowship is not easy, but that is no reason to fall into isolationism! The key to any healthy church is the centrality of Christ, followed by three essential elements: a shepherd, an evangelist and a teacher. These three form the “stool” upon which the congregation can thrive and grow in a balanced way. Remove any one of the three and the stool falls over! For former Jehovah’s Witnesses who are now born-again, perhaps there will always be a degree of disconnect with the institutional church. Perhaps some of this can be attributed to latent JW baggage, a kind of anti-authority, anti-leadership mentality. For example, churches generally employ systems of government which former Witnesses find oppressive. Some would argue Church government is unnecessary; after all Christ is our head and therefore we surely do not need the “control” of elders or pastors? I would agree we do not want Control. However, God is a God of order wherein he calls individuals to roles within his Church including the role of shepherd (1 Peter 5:2, Ephesians 4:11-14). Consequently whether we fellowship in a gathering of one hundred people or three, someone must take the lead, otherwise chaos may ensue (1 Corinthians). Time does not permit an in-depth study of the various Church government perspectives; suffice to say each can find some support from scripture. Bearing in mind that being a child of God equates to being part of the family of God should be sufficient to promote authentic Christian community. Herein we share with one another our possessions, our hearts, our pain and our love (Acts 4:32-33). Do the scriptures reveal any organizational systems? Yes, God elected Israel and presented to her the Law of Moses. To a large degree these laws outlined principles for living in harmony with one another and God (Genesis 17:17; Exodus 24:12). What was the purpose of this election? Israel was to be the channel through which Yahweh would bring blessing to the world, ultimately through Messiah (Genesis 18:18, Daniel 9:25-26). Yes Yahweh was the “King” and ruler of his people Israel (Isaiah 44:6). Are we still in a theocracy? No. With the death, burial and resurrection of Christ the theocracy ended. Today we live in the Church age; a universal community of believers united in Christ through divine re-birth (Luke 13:35). Does the NT provide us with blueprint for a modern-day organization? No, Church is not an organization however there must be some organization in the Church. Order is maintained through God’s ordained callings and gifts for the edification of the saints. Each Christian has freedom in Christ to explore the various expressions of Christianity and fellowship and worship where he/she feels led. No “absolute” blueprint exists. Remarkably and alarmingly the WBTS views itself as “Jehovah’s theocratic organization”. This strange synthesis of God and organization has resulted in the deification of the WBTS. 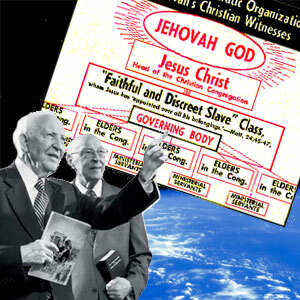 The result is the organization can do no wrong because it is believed to be “Jehovah’s organization”. However contrary to this position, we have seen how this is an illusionary concept. The only way to be truly “Free” and close to God is to abandon man-made organizations/religions (Revelation 18:4) that control and dictate and submit to our creator, the Lord Jesus (John 1:3; Hebrews 1:2-3, 8, 10). This move towards God is a personal intimate experience. What wonderful inspired words of divine love and encouragement to continue in fellowship with the Father, Son and Holy Spirit! I trust you will find this somewhat unusual discussion of “organization” helpful in your ministry to the Jehovah’s Witnesses and in your personal walk with our Lord. May we continue to submit to our King and Savior in all things as we walk together as part of the universal Church of Jesus Christ, Amen! Holden, Andrew “Jehovah’s Witnesses – portrait of a contemporary religious movement” Routledge 2002 pages 140, 81. Bowman Robert M, Jr. “Jehovah’s Witnesses – why they read the Bible the way they do” Baker Books 1992 page 91-92. Louw, J. P., & Nida, E. A. (1996). Vol. 1: Greek-English lexicon of the New Testament: Based on semantic domains (electronic ed. of the 2nd edition.) (445). New York: United Bible Societies. I would recommend further studies of Israel using the following publications: Feinberg John S. “Continuity and Discontinuity – Perspectives on the relationship between the old and new covenants” Crossway 1988. Diprose Ronald E. “Israel and the Church – the origins and effects of replacement theology” Authentic Media 2004. Vlach Michael J. “Has the Church replaced Israel?” B&H Academic 2010, and for a discussion of the development of supercessionism see Soulen Kendell R. “The God of Israel and Christian Theology” Fortress Press 1996. Wyschogrod Michael “Christology: The immovable Object” Religion and Intellectual life 3 (1986) page 79. Soulen Kendell R. “The God of Israel and Christian Theology” Fortress Press 1996 page 9. Wright David F. and Hammond T.C. “In Understanding be men – A handbook of Christian doctrine” IVP reprint 2002. I should point out that in my personal opinion a growing number of mainstream evangelical denominations are falling into serious theological errors, including: ecumenicalism, emergent theologies, hyper-charismatic extremes, liberalism and anti-Semitism. If a Church leans towards a social Gospel and liberal, libertarian ideologies then I would urge caution. Also check out Church “affiliations” which can highlight potential problems. A Christian looking for a new Church should always check the faith statements of potential candidates. In my experience evangelical “free” churches that adhere to orthodox Biblical theology are a good place to start. For further consideration please see; Denver Mark “What is a Healthy Church” Crossway Books 2007; Brand Owen Chad, Norman Stanton R, et al “Perspectives on Church Government – five views” B&H Academic 2004. See Hellerman Joseph H. “When the Church was a Family” B&H Academic 2009.